Your patio and driveway have turn into so soiled that they are getting dangerously slippery? Order the services of Excellent Carpet Cleaning. We are a professional jet washing and hard floor cleaning company delivering first-class cleaning services in Isleworth TW7at an excellent price. We will gladly provide you with the professional scrubbing, hard floor cleaning, polishing, anti-slip protection, sealing, tile recoat service you want. Our cleaners arrive with the expert cleaning solutions and tools to clean any type of hard floor indoors or outdoors. The floor is hoovered with a pro vacuum and examined for any stains and other dirty parts. If there is polish or other sealing on the floor, it is eliminated with the ideal tools. The solutions are tried on a small area before being used. The stains are pre-treated, and then a spray or other suitable method is used to wash it. Depending on the type of floor being cleansed, the cleaners may rinse, scrub and dry the floors. For some kinds of floors, modern technology is used for the emulsification, heat, pressurized cleaning, and efficient capture of the waste. Once the grout and floor area have been professionally cleaned and on-going protection is achieved with an impregnator. We have been deliveringbusiness and home owners in Isleworth TW7 with a skilled hard floor cleaning, scrubbing, polishing, sealing , anti-slip protection service and tile recoat since Excellent Carpet Cleaning was founded back in 2005. We are well known for our high quality and reliable polishing and hard floor cleaning services, grout and tile cleaning, grout colour sealing and recolouring, repair of porcelain and ceramic hard floors as well as for our skilled vinyl floor cleaning, specialized stone and slate floor cleaning, expert floor polishing and sealing and the hard floor sanding service. Throughout the years, we have become one of the top preferred local suppliers of commercial and domestic hard floor maintenance and cleaning services. Our cleaners come set up with the newest technology for pressurised cleaning, emulsification, heat,, and effective capture of the waste material. 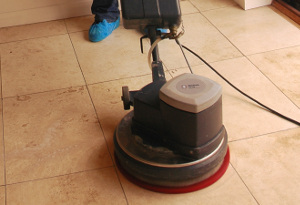 A specialized vacuum cleaner is used to clean the hard floor area from any debris and dust. Any old sealant is eliminated with professional floor polish stripping and sealant removal techniques. All stains, dull spots, watermarks and micro scratches are pre-treated and then a spray or other solution is used for the cleaning and buffing of your flooring. During the stone or wood cleaning, any surface soiling is thoroughly eliminated. The cleaner might need to scrub, rinse and dry the hard floor. Once the floor and grout surface have been expertly cleaned, continuing protection is achieved with an impregnator to keep it covered from soiling and staining. Our cleansing agents can clean your backyard hard floors via jet washing. We provide high quality: patio cleaning, driveway cleaning and pressure washing. The exterior cleaning contains - decks, paths and drives. So, no matter what sort of hard floor you currently have. If you are in Isleworth TW7and require a competent jet washing and hard floor cleaning service, book us! Purchasing one or more of our expert cleaning services is effortless, quick and free. Get in touch with our helpful customer support team, and you will be given written confirmation for your booking in no more than Two hours. Contact them via the online booking form here, or by calling 020 3404 0500. No advance payment is needed. All of our cleaning rates are set without any covered fees. We offer cleaning on holidays or weekends also. If you order a combination of Two or more of our cleaning services at once, we will give you very attractive deals from our price. If you reserve early on or you are a regular customer, you will be rewarded with our special rates. These rates are also viable for all local owners and companies. Reserve our hard floor service and jet washing now to get your floors rejuvenated, cleaned and safe for walking.